Let this cute Noah's Ark Mezuzah guard the entry to your home. 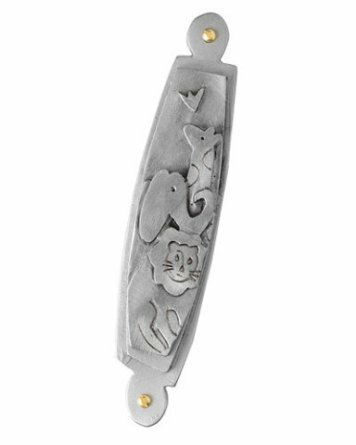 This unique pewter mezuzah by artist Emily Rosenfeld is engraved with contemporary images of a lion, elephant, giraffe, and dove. For Jewish households the mezuzah is meant to be a reminder of the presence of God and his commandments. It is a blessing upon the house in the form of a small, hand-written scroll placed inside with the Shema Isreal written on it in Hebrew (Deuteronomy 6:4-9 and 11:13-21). The placing of the mezuzah on the doorpost of a home or business protects the inhabitants whether inside or outside. Some have even referred to it as a "Jewish security system." The Noah's Ark Mezuzah is handmade in Massachusetts. For more information or to order, click here. Update: There is a wide variety of Noah's Ark Mezusahs you can buy, see a wide variety of Ark Mezusahs here.